Pulsed-field-gradient NMR spectroscopy yields ensemble-averaged local information about dynamics in diverse systems. One goal is to create model systems (colloids, vesicles...) that can be simultaneously studied by diffusion NMR and confocal microscopy. NMR gives fantastic ensemble averages and works in opaque systems or systems where the building blocks are nanoscale. Confocal microscopy gives insights into single-particle motions. 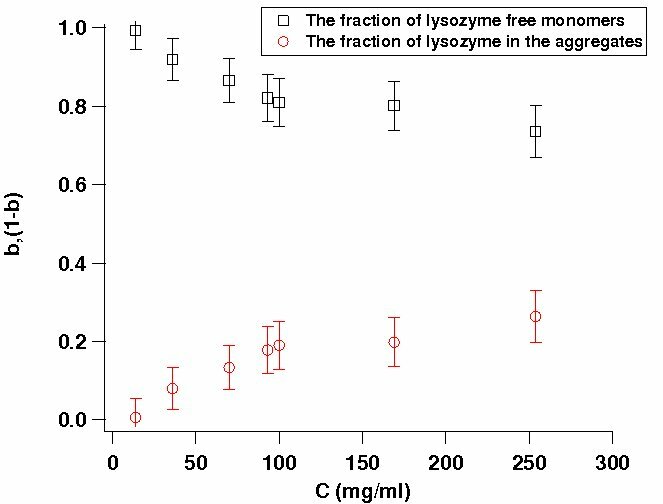 Concentrated lysozyme solutions have complex interactions. But a body of work has suggested that they can be treated in the same way as colloidal systems - as blobs with competing attractive and repulsive interactions. Small-angle neutron scattering studies reported the existence of "equilibrium protein clusters". One can think of this as a macromolecular liquid-gas coexistence, arising from competing interactions. However, other scattering studies arrived at other conclusions, so the existence of equilibrium clusters was an "unsettled" problem. 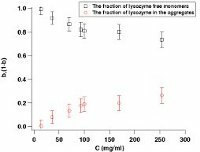 We have used NMR diffusometry (again) to address detailed questions about the composition on the molecular scale via careful analysis of the dynamics. We find: yes, there are equilibrium clusters. Moreover, we can quantify the fraction of protein molecules in the aggregate state and the fraction in free form. 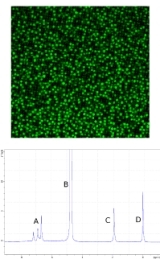 We have used NMR diffusometry (along with relaxometry and chemical shifts) to obtain quantitative information about macromolecular aggregates in aqueous polymer--surfactant and protein solutions. The key element is the ability to get spectrally resolved diffusion coefficients: this means we can track the mobility of all components in multi-component solutions simultaneously. From this we can make quantitative statements about the partitioning of the components: e.g. how much of the surfactant is free, how much is in a polymer-surfactant aggregate, what fraction is in free micelles with no polymer (see figure, and Article 4 below). 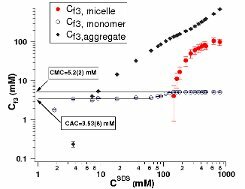 We have used diffusion NMR to elucidate structural information in anisotropic surfactant mesophases. Surfactant mesophases have complex memory effects arising from varying degrees of partial ordering making the data on solvent and surfactant diffusion in different phases (diffusion coefficients as a function of surfactant molar fraction) very noisy. We devised a method to look at well-aligned samples of non-ionic surfactant mesophases that allowed clean characterization of the phase diagram via diffusion coefficients (Article 1), allowing us to make quantitative statements about the hexagonal and cubic phases. The tracking of memory effects across phase transitions placed concrete limits on the structure of the lamellar phase (Article 2). We are currently designing a colloidal model system for diffusion NMR studies of colloidal dynamics in binary colloidal mixtures. 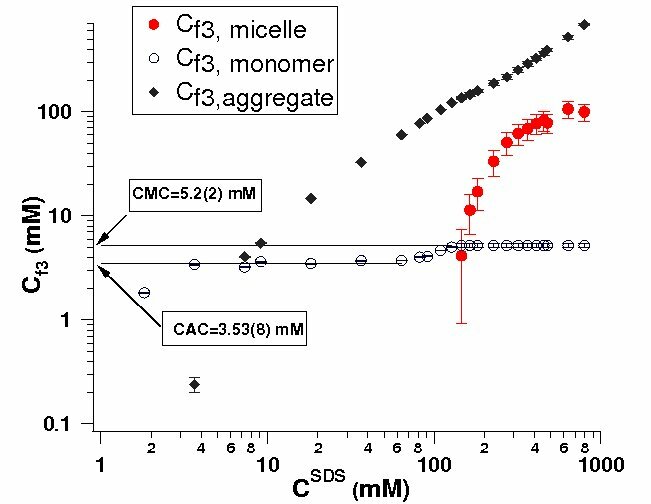 Colloidal systems of controlled size distributions have not been studied by diffusion NMR in the past. Such a study was desirable because bidisperse colloidal diffusion is difficult to measure in a model-independent way. We have devised monodisperse and bidisperse colloidal suspensions where the diffusion of each component is obtained independently. Such systems will be used to study in detail the dynamics on approaching a glass transition.